The "Agna" (Dictates of an Independent) is to remain in the present and well utilize the present to its full efficiency and value to experience the very Real being, and that happens only through Pure Soul “Purusharthth" of “Real View Point". In today’s world, despite comforts and amenities, people generally lack inner happiness and harmony. In such a scenario, Holistic Science, as revealed by Dada Bhagwan and Holistic Scientist Kanudadaji, has many valuable insights to offer. 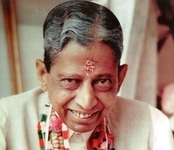 Dada Bhagwan attained enlightenment in 1958, and his philosophy is being propagated by Kanudadaji. Holistic science or Vitraga Vignan is the science of the inner Self. It is a science because thousands have adopted Holistic Science principles and discovered its benefits equally. So, what is this science all about? It is a science about one’s own life. Human life is a unique, live experiment of the universe; you can conduct experiments using your mind, body and speech, and experience the results according to your vision or understanding. Is Life A Race Course? The human mind and ego often try to be happier by competition and comparison. I may have satisfactory earnings and a nice flat to live in. But when I see another friend with higher earnings or a bigger flat, I want to get ahead. We forget that on a race course, only one horse gets to the number one slot and all others are left behind. Even the horse which wins the race feels the stress. So, who is happy? You may ask how can one live and progress without competition. But observe Nature: Does a rose bloom or a mango ripen in competition to anything? It follows a natural and normal process of growth. Thus, normality is the essence of life which, if applied to work, business, relations and all facets of living, will keep us on the right track. The trick is to enjoy whatever is available to you and not hanker after what is unattainable. The key to happiness is to make another person happy. When you decide to help someone, you start to experience happiness yourself even before helping. Try it. If someone decides to distribute chocolates to some children, the person feels good about the act before it actually happens. On the other hand, if I decide to do something negative, like fire my staff, I feel disturbed inside, as if I’m being fired myself. So whatever actions of my mind, speech and body are geared towards making others happy, will make me happy first and the ones which are meant to hurt others would hurt me first. The mantra is, “I will be helped, before I help others”. Before obliging others, I am being obliged first. In self-interest, I should resolve and pray every morning. Let my mind, speech, and body not hurt any living being, even to the slightest extent, and let my mind, speech and body make others happy. If one has a shop of sweets, one would never be short of sweets. Similarly, if one opens a happiness shop, one would always have it in plenty. How to open such a shop? What are the inventories? Who would grant us a loan? The answer is very simple. Our mind, speech and body are precious natural assets and if it is our inclination, attitude and resolve to oblige others and to make others happy, the rest would be done by Nature. It is not necessary that you can help only by giving money; you can also help by listening and guiding someone in trouble. Did you know, to oblige is a privilege of human life? We may be in any profession, but if our intention is to help, oblige and make others happy, then money, name, fame and everything else would come as a by-product. The motive or intention is the main thing. If one has the priorities or, the main product, well-defined, the by-products would come along, free of cost. One may or may not learn scriptures of soul and books of philosophies, but one must at least learn how to lead a happy, harmonious, positive and meaningful life, within and without. If you can win the hearts of all those whom you are living or working with, then you have won your world. You should all feel increasing love, with time. The relationship between a husband and wife is a pious one. It can be best lived as friends. When two people marry, they try to become one. But the two egos, the ‘I’s, remain separate. As long as one ‘I’ is loving, caring and sharing with the other, it is heaven on earth, but if one tries to win over the other, then what happens? In fact, we should use the words ‘we’ and ‘ours’ rather than ‘I’ and ‘you’ or ‘mine’ and ‘yours’. Bringing up children is also a test for parents. Children are like our thermometers. Parents have a profound influence on children as they learn from what they see. Children seek only love, and pure love is one which is free of expectations and conditions. The experience from daily life is the first step towards spiritual progress. Param Pujya Shri KanuDadaji, Janam Din Mubarak! Happiest of Birthdays to You from your nanla vaahla Youth of Jai Sachchidanand Sangh! Our deepest obeisance to You today! Though we are 3 continents, 1 ocean, numerous seas and countries away, it is via your ‘Pratyaksh’ presence we are enjoying Your company in Kelanpur Tirth Kshetra today. Please do bless us today that this divine company may forever remain! It our most humble privilege that today we are blessed to enjoy, as Sakal Sanghpati Shri Sudhiruncle mentioned in Ahmedabad, the continued ‘Prakash’ of the Sun which is the direct presence of the ‘Akram’ science of ‘Rushabhdev Dada Bhagwan.’ Our heartiest lagutam-bhave pranam to Pujya Bhaveshbhai! Enriching our lives with His presence was an ultimate gift we are ever gracious for! Please send us Your aseem krupa to optimize and maximize our internal energies in sincere alliance with the opportune time of dual presence of You with Pujya Bhaveshbhai. Last year in Los Angeles, we were graced by the presence of both You and Bhaveshbhai. During that time, Pujya Bhaveshbhai engaged in satsang and activities with JSS Youth USA, shining His divo of divine light upon and which was surely felt by JSS Youth at large. What a marvel of vision Bhaveshbhai inspired for us! Please do grace us so that we may enjoy the co-presence of Pujya Dadaji and Pujya Bhaveshbhai once again for Gurupurnima in Dallas, TX. JSSY has taken great strides this past year through projects aimed at expanding our understanding of Gnani Purush. After the successful interview of Manharba last year, JSSY was blessed to learn and share more about You through her eyes. We long to continue Part II of Manharba’s discussion this year to learn more about Pujya Bhaveshbhai through her eyes. Also, we are most grateful to Shri Kaviraj, who JSSY in Mumbai had the opportunity to interview last year and share the melodious joys of the divine pads. We are looking forward to Pujya Bhaveshbhai’s presence, guidance, wisdom, and involvement with JSS Youth Worldwide. With our most humble of requests, we extend an early warm and ardent invitation to You, Manharba, all Aptaputras, Pujya Shri Kaviraj , Pujya Amin Shaeb and the entire Jai Sachchidanand Sangh Vadils and Mahatmas worldwide and Youth around the globe to the Gurupurnima and International Youth Shibir in Dallas, TX in July 2013!!! Once again, Happiest Birthday and our deepest obeisance to You and Manharba today. ‘Vitrag path’ is exactly opposite of world-view path, that is worldly living. We are all Blessed that this October 9th, 2012 Param Pujya Shree KanuDadaji Janmotsav will be celebrated at Baroda. As usual Internet Satsang announcements will be sent by our JSS Youth, all Dada’s Mahatmas are humbly requested to participate in this Divine celebration via internet relay. 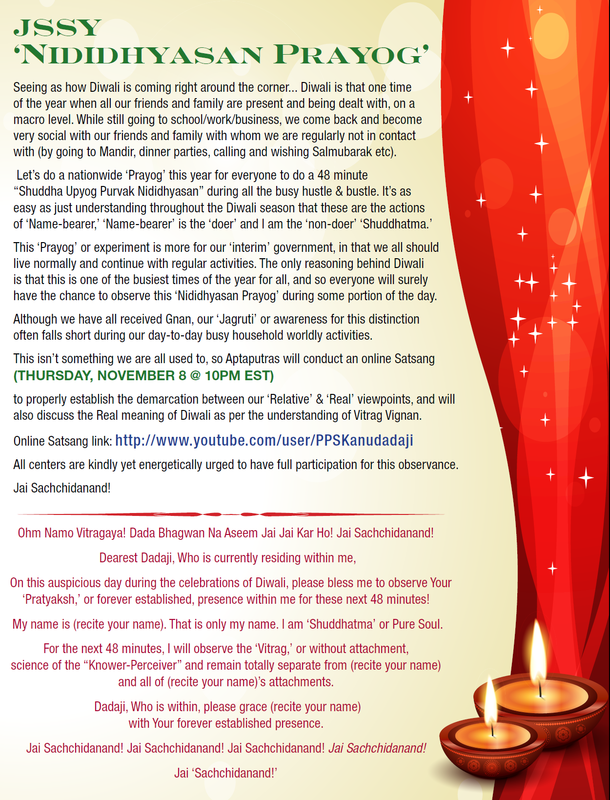 Jai Sachchidanand Sangh worldwide Blessed announcements for the next Gnani Divine link will be made during this celebration. President, Jai Sachchidanand Sangh Inc. USA. Understanding results into behavior, behavior that is inner behavior that is the state of being.